I need to make the img tag width and height 100% inside overflow hidden div while maintaining the aspect ratio. What I reached for is putting the image within overflow hidden div And the image is max-width 100% and auto height. I rethought and I found eligible solution for me, I don't know if will suit anyone else !! Your image is 1024px wide X 768px high. So width to height ratio= 1.333. 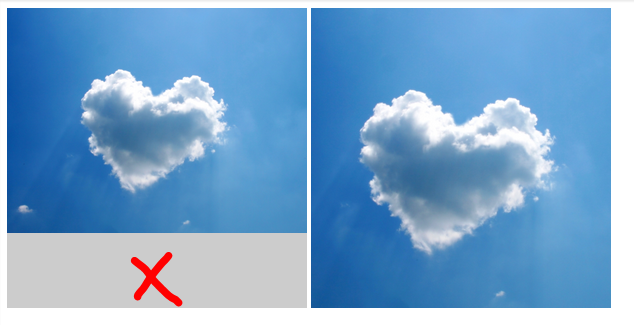 However your overflow:hidden div has a raio 1X1 - so the image will be distorted at 100%. So in order to display the image to ratio - you need to increase the width by 133%. Then, in order to center or 'crop' the image to fit the div - use margin. I really did not understand why it shouldn't be possible to use a background-iamge!? So you can use the example code as long as the width and height of the containing div remains the same and also the aspect ration of the image stays at 4:3. Not using a background-image make the whole thing very "fragile" ..., and from a semantically point of view it is also "not ideal". Would be better to use a server side technique to crop the image to the desired/ needed size. max-width: none !important; // To make sure that width of the image can be larger than its container. How do you stretch an image to fill a <div> while keeping the image's aspect-ratio?